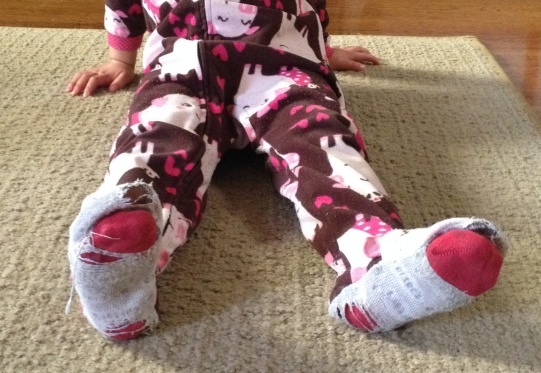 This is what happens when a two-year-old refuses to wear anything but her piggie romper to bed. This entry was posted in Family, Kids and tagged Bedtime, Family, Humor, Kids, Littles, Parenting, Silly, Sleepytime, the Girls, Toddlers. Bookmark the permalink. Happy to have discovered your blog. Sad that I’m finding you just as you’re leaving San Francisco, but looking forward to seeing more of your adventures in Michigan with your family! Cheers. Thank You! Enjoying your blog, too! Ahhh that’s good. They’ve had lots of tender loving. Save them, let her see it when she’s all growd up! Ha. Maybe I WILL save it!